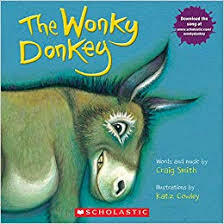 A few months ago the Internet was taken by storm by a video of a Scottish grandmother trying, without success, to maintain her composure while reading a story to her grandson, Craig Smith’s The Wonky Donkey. At the time I was anxious to read the book for myself, but apparently so were many other people. The book was sold out. Recently, though, I tried again successfully and managed to find a copy—and it is every bit as delightful as the video. I had so much fun with The Wonky Donkey’s silly rhymes, I started imagining new variations. How about a damp frog in a bog, a slightly soggy boggy froggy? Or perhaps the frog is bad in the mornings—an early groggy, slightly soggy, boggy froggy? Or he likes to dance—a western cloggy, early groggy, slightly soggy, boggy froggy. Yes, I guess I do like to be silly. But if I can invent a soggy boggy froggy, imagine what your students can create, inspired by this three-legged donkey. Aside from the silliness, The Wonky Donkey and variations provide a great opportunity to expand vocabulary and learn about rhyming dictionaries. There are lots of online options to help you, for example, Rhyme Zone will help you find rhymes, near rhymes, as well as similar sounding words, homophones, and more. It’s a fine resource for budding poets and songwriters. Perhaps in the craziness of impending holidays, you can use a language arts activity to lighten your spirits. From young children just learning to rhyme to older students expanding their songwriting vocabulary, The Wonky Donkey provides a perfect opportunity. If you don’t have a copy, you can find a song version here, or just watch the viral grandmother below. If you can watch that without chuckling, you have more self control than I do! Priceless!! And what great inspiration for creating more, even funnier, rhymes.